The first step is an elliptical transfer orbit to the orbital altitude desired, which requires a propulsion burn to leave the low-altitude orbit; the second step is a propulsion burn to match the circular orbital velocity at the desired higher orbital altitude. This process to return to the low orbital altitude requires a burn to match the elliptical orbital speed at the higher altitude, then a second propulsion burn to match the lower circular orbit speed. This is a minimum energy transfer orbit, or a Hohmann transfer. Equation (5.1) provides the magnitude of the circular orbital velocity at the desired altitude. 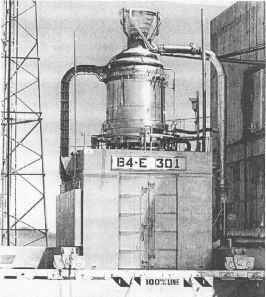 Figure 5.6. 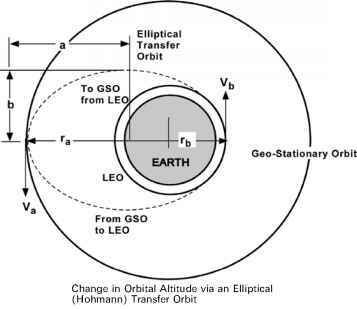 Transfer ellipse to change orbital altitude. orbital altitude (periapsis) and the highest orbital altitude (apoapsis). Equation set (5.6) provides the orbital parameters for Keplerian elliptical orbits.